What a magical find – a dried (and whole) starfish sitting right there on the beach! I can’t say that I’ve ever found one, just pieces. Unlike the mollusk’s shell, the exoskeleton of the sea star is easily broken that is why it’s difficult to find a nice specimen to collect. Sea stars are popular designs for clothing and stationery too, and I’ve found that many Brides choose starfish wedding paper as often as they choose palm trees to signify a beach themed wedding. 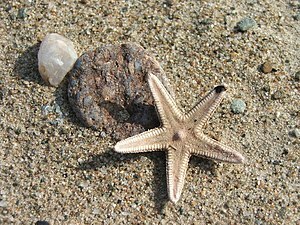 Finding one little starfish on the beach is a special gift, but finding two – well, that’s romantic! On southern Florida beaches you may see the five-armed “lined sea star” or the “nine-armed” -and that’s it’s name – sea star and those can be a foot across in size. There is also a smaller, reddish one that contains little spines. After storms you may come across living sea stars that have washed up on shore since they live in the sand in shallow water. If you find living ones on the beach you could place them back into the water, because without water they will not be able to move, and will dry out and die in the sun. In Florida the sea stars are more commonly found on southern beaches, including the Keys and in the panhandle area.